"FM" wasn't on my dial. Neither was Bobal. It's been a pleasure getting to know both. Have you ever heard about BOBAL? To be honest, I only 'stumbled' upon it on my very first trip to Valencia (Spain). Bobal is actually native to Valencia. The name derives from the Latin bovale, in reference to the grape's shape of a bull's head. It is grown predominantly in the Utiel-Requena DO where it represents about 90% of all vines grown, and also present in significant quantities in other parts of Valencia. It was first mentioned in 1478 and about 70,000 ha are planted with Bobal in Spain today. But so far it has failed to attract any major attention outside of Spain. In the past most Bobal was sold as cheap Spanish bulk wine and used for grape juice concentrates. 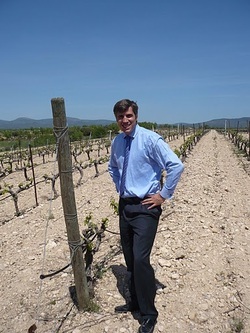 Only recently, oenologists in Utiel-Requena discovered its potential to produce very powerful, yet elegant wines --- if the grapes of very old vines are used. Valencia means not only to explore the town of Valencia but also side trips to Alicante, Utiel and Requena. And on my Requena trip I met Fernando Martinez who in turn introduced me to (his) Bobal. To be exact, he shared an extraordinary bottle of his 2006 Bobal with me at a terrific new wine bar located downtown Valencia. This wine was made from over 100-year-old vines and had a fascinating, complex structure, yet it was silky smooth. How was it possible that such an extraordinary wine like Fernando's Bobal wasn't as well known as some of the greatest Cabernets from Napa, Barolos from Piedmont or wines from Bordeaux? Well, you're only ONE click away from finding out 'WHY'...but before you click, follow us on twitter.